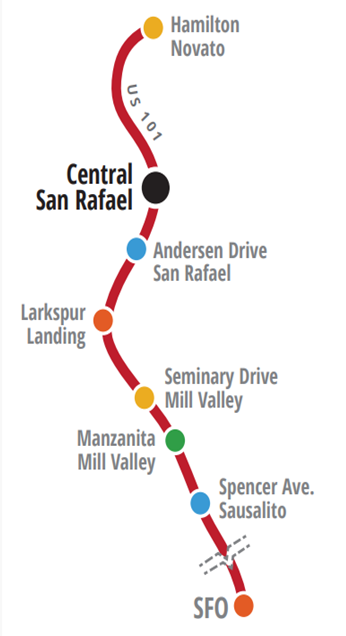 Buses leave from the Central San Rafael Transit Center once an hour at 10 minutes after the hour, starting at 4:10 AM until 10:10 PM. The trip to SFO takes a minimum of 1 hour & 20 minutes, but may take longer depending on traffic conditions. Please allow plenty of time to travel. Traffic delays are common and should be expected. Tickets may be purchased from your driver for cash, from the cashier at the Andersen Drive terminal, or online through the link below. Tickets purchased online may be printed and given to the driver, or you can display the ticket barcode on your phone. Please be sure to complete your ticket purchase before boarding the bus so as not to delay the boarding process. The San Rafael Transit Center is located between 2nd and 3rd streets, and Tamalpais and Heatherton Ave., on the west side of Highway 101. The Marin Airporter stop is near the corner of 3rd and Tamalpais. Take the Central San Rafael exit from Highway 101. The Transit Center is on the west side of the freeway between 2nd and 3rd streets. There is no long term parking available for Marin Airporter customers at the Transportation Center. Street parking subject to posted limits.